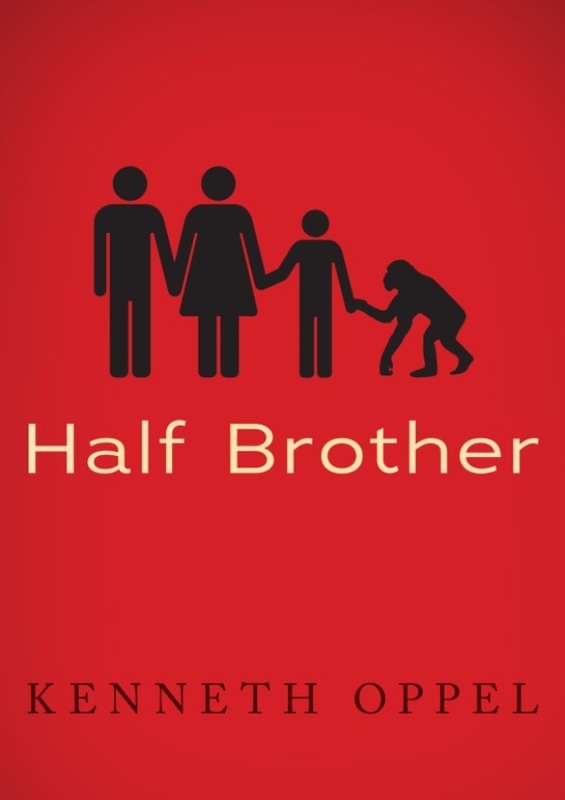 Kenneth Oppel is the acclaimed author behind the 'Airborn' trilogy and the 'Silverwing' saga, both of those series I loved and was extremely excited to read this new book called 'Half Brother'. With a very simple design for the cover, which uses very standard iconic symbols, it is presented in a scientific and structured style, only broken by the image of the chimpanzee we discover to be 'Zan'. This is an extremely effective cover and definitely grabs the eye. Ben Tomlin moves to Victoria as his parents (who are scientists) begin a new study on language and cross-fostering, bringing into the family a baby chimpanzee whom they named 'Zan'. The aim of the experiment was to see if they could successfully teach 'Zan' sign language. Before long, Ben is very much the big brother to 'Zan', playing with him and helping him sign. Despite the success and speed at which 'Zan' is learning new words, the experiment meets many obstacles including scientific validity, protests and even media scandal. Ben's also distracted by a pretty girl at school named Jennifer, his choice of friends at school and his combative relationship with his father. The strength of all of Oppel's novels is his deep characterisation of the main characters, in this case Ben. Oppel manages to capture all the different emotions running through this young teen's body, from anger to passion, jealousy to pride and it is a character young/teen boys could very easily relate to. Another immediate strength is the relationship between Ben and his father as well as the marital relationship of their parents. The details of their fights and intentions, the subtle hints and sarcasm make their conversations immensely gripping, genuine and realistic. Unfortunately, the female love interests in the book doesn't get as much development which is a shame, given Kate in Airborn was completely dynamic, though in this book, the relationship Ben has with girls was only a minor plot and his love for Zan can only be shown to be more powerful by contrast with his other relationships. The scientific aspect of the book and animal psychology reminds me of The Life of Pi by Yann Martel as it discusses ideas about animal thinking which is truly fascinating. Can Zan really understand and converse with Humans? This was a large question in the book which led to problems in the experiment- Ben's belief that Zan truly was communicating opposed to his Dad's conclusion that Zan is merely copying and reacting to stimuli. Whilst I felt slightly disappointed by the melancholic turn in the plot (I wanted a happy ending where Zan could live with them and really communicate with them), I was excited by the final few chapters as it was then that it truly felt like an Oppel book - there had to be some risk, some adventure, some heart thumping climax, though the book keeps you grounded in a realistic yet appropriate ending, but finishes it off with a lasting catharsis and a sign of hope, the final paragraph causes emotions to gush out. 'Half Brother' tells of a beautiful brotherly relationship between Tom and his brother Zan. Despite being a different species, the care and love they have for each other is truly inspiring. This book focuses on the many relationships a person may have in their lives and the dynamics of these relationships. In this way, this novel is a refreshingly themed story from Kenneth Oppel, who doesn't fail to leave his mark on this emotional and heartwarming tale about what it means to be a family. I now await his next novel, This Dark Endeavours, which will be out in August and has already been green lit to be adapted into a movie! Can't wait!